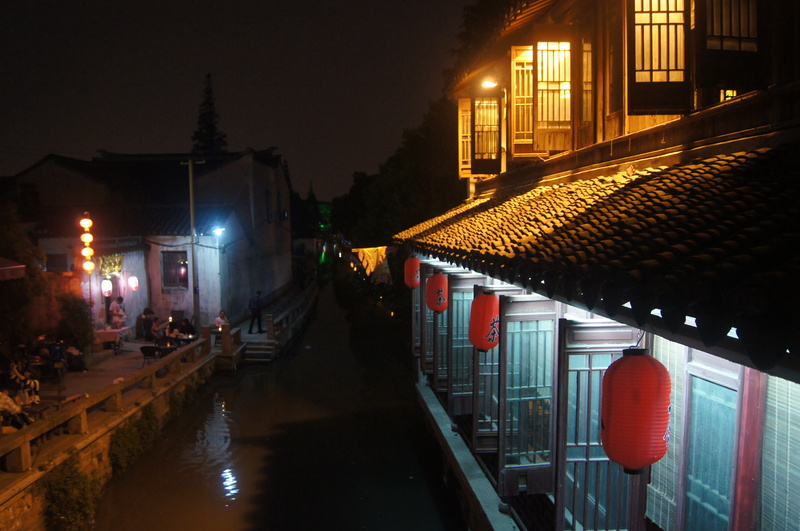 Night scene: the canal at Ping Jiang Lu. Photo: Jessica Li 李洁青. Ping Jiang Lu is a narrow street running north from Gan Jiang Dong Lu that has been turned into a tourist venue. Despite all the shops and restaurants, art galleries, cafés, and teahouses, it retains a good deal of charm. Popular alike with locals, Chinese tourists, and foreigners, the street is often packed with folks strolling, window-shopping, snapping photos, or people-watching from one of the benches that line the small canal running along its western edge. Street vendors, dogs, and e-bikes add to the crush but also humanize the scene. The street is equally enjoyable during the day, when the beauty of the canal and the old buildings dominates, or at night when the lighting provides another kind of spectacle. There is at least half a day’s worth of shops, galleries, and eateries to explore. I especially like one of the most modest restaurants on the street: Tao Ye Pu (桃叶铺), at number 46. With a narrow entrance and enough seats for only a dozen or so customers to sit at tables and benches that fill every square centimeter of available space, it is unlikely to attract your immediate notice. But they serve delicious Chinese desserts, and if you are brave you can even try their chicken feet. Personally, I stick to the sago puddings with coconut milk and fresh fruit. Watch for the stone footbridges that cross the canal at intervals. Some of them are quite old. My favorites are the simplest, plainest ones. If you begin at the south end and walk north, you will emerge at the west end of the pedestrianized part of Dong Bei Jie, the walking street where you will find the Humble Administrator’s Garden, the canal boat tour dock, and the Suzhou Museum. The Lion’s Grove Garden is also within easy walking distance. If you want to see what Ping Jiang Lu looked like before it was spruced up, turn onto one of the side streets leading east and follow your nose. About halfway along Ping Jiang Lu you will see a street leading east called Zhong Zhang Jia Xiang, which will take you to the Kunqu Museum. If instead you stay on Ping Jiang Lu you will find, just a few steps north of Zhong Zhang Jia Xiang, a small bridge that crosses the canal and takes you onto Da Ru Xiang. At number 38 is the Ping Jiang Cultural Center (平江文化中心), where you may be able to see a performance of kunqu or pingtan. If not, just poke around; it’s a beautiful little corner of Old Suzhou. The entire area continues to be developed, with new shops and galleries open every time I visit. It’s a very pleasant place to stroll and wander, especially on a beautiful spring or autumn day or a warm summer evening. If you go there once, you will want to return. 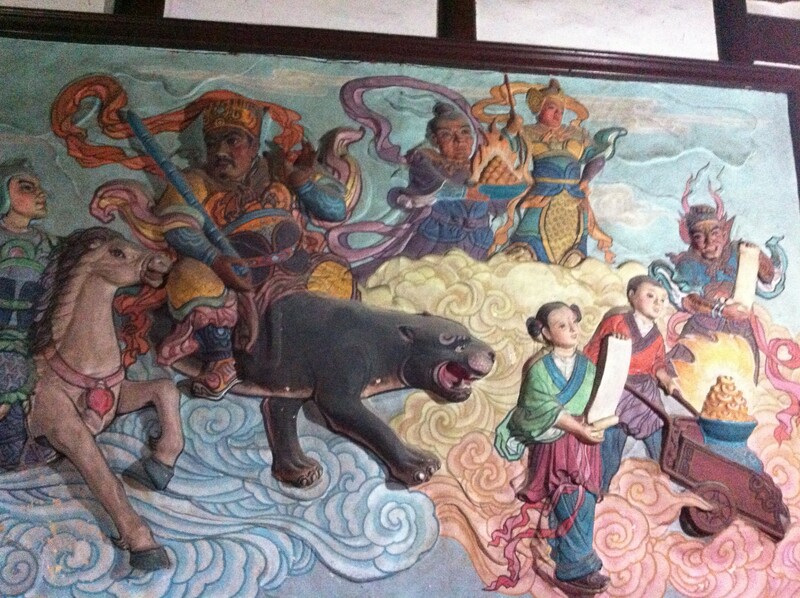 Mural in the Xuan Miao temple complex, Guan Qian Jie. Everyone who lives in Suzhou knows Guan Qian Jie, and everyone who visits Suzhou goes there, so I will add just a few points that you might otherwise miss. As you walk from Lin Dun Lu westward, look for a small Bank of China on the right. Just a few doors beyond, at number 64, is the Wang Hong Zhu Medicine Shop (王鸿翥药店). On the first floor are the usual displays of ginseng roots and other exotica, often elaborately arranged and priced only for millionaires. The real surprise, however, is up the stairs at the back of the shop. On the second floor is a row of booths where patients consult with doctors, and opposite them is where the prescriptions are filled. Scores of variouis leaves, roots, seeds, and more are kept in large drawers. The prescriptions are filled by measuring the ingredients with balances, dividing them into daily doses, and then wrapping each day’s dose in brown paper. The patient then takes these packets home to prepare the medicine. (The process is pretty simple: the ingredients are soaked, then boiled, and the liquid is poured off into two one-cup doses per day.) If you prefer, they will cook the medicine for you; come back a day later and you can pick up plastic bags of liquid, two per day. You probably do not want to drink Chinese medicine, but you may be interested in having a Traditional Chinese Medicine doctor’s advice. If you speak Chinese or have a translator with you, pay the nominal consultation fee at the counter, then wait in line to see the doc. He (or sometimes she) will ask you questions, take your pulse, and look at your tongue. Then he will write a prescription if you want one, or just offer advice if you prefer. These old-time medicine shops are disappearing, as people prefer to go to hospitals. At the Suzhou Traditional Chinese Medicine Hospital, while the care is excellent, the atmosphere is not the same. The old wooden drawers and the heady mix of aromas from the loose ingredients are missing from the hospital, where everything is pre-measured in plastic bags. Across the street from the medicine shop, at number 91, is a large store in a traditional building; you will notice the red lanterns hanging from the eaves. The name is Cai Zhi Zhai ( 采芝斋 ). Here you can find a huge collection of traditional Suzhou delicacies, many but not all of them in the form of candies. The shop dates to 1870. According to the story, the shop became famous and popular after the Empress Dowager Cixi sent for a Suzhou doctor, who brought her some candy from Cai Zhi Zhai and cured her. (The main ingredient, fritillary sugar, is still used in Traditional Chinese Medicine for coughs and sore throats.) Chinese tourists often come here so they can take home items that are not available where they live. If you are traveling to other parts of China and want to pick up some inexpensive gifts or treats to offer to hosts, drivers, or simply people you meet, this is a great place. “Guan Qian Jie” means “the street that runs in front of the Taoist temple.” Everyone who goes there sees the temple, whose name is Xuan Miao, but surprisingly few actually go in. Give it a try. Start out on Guan Qian Jie and go through the original entrance, which has now been turned into a jewelry shop. Ignore the jewelry, and take some time to study the fearsome statues at right and left. These are the guardians who protect the temple grounds from evil spirits, and so they are well-intentioned. (That did not mollify my son when he was a little boy, however: he took one look and walked right out.) If the door at the back is unlocked, walk straight toward the temple itself. Buy an entrance ticket at the kiosk out front, and then go in past the incense burners. Philosophy students will be confused by their first encounter with folk Taoism, which is a far cry from the minimalist poetry of the Tao Te Ching. Folk Taoism has produced a torrent of gods, demons, and spirits of every possible shape and temper, and the apparent intention is to propitiate every possible supernatural power. There is something very Chinese in this openness, which is illustrated again in the way so many people will make offerings at both a Buddhist and a Taoist temple, just to be on the safe side. So don’t worry too much about making sense of things in Xuan Miao. Just wander as you will, inspect the corners, and enjoy. Your ticket entitles you to visit the shrines at either side of the temple—don’t pass them by. Since I am a literature teacher, I was especially delighted to discover that the Taoists honor the Literature God, Wenchang Wang (文昌王). Enter his shrine opposite the craft booths along the east side of the temple. After passing through a small courtyard, you will see the shrine itself. Straight ahead are three large seated figures: the Literature God in the middle, flanked by Confucius on one side and Zhu Xi on the other. Everyone knows about Confucius, but Zhu Xi will be unfamiliar to many Westerners. He was the preeminent Song Dynasty “neo-Confucianist,” and the man most responsible for establishing the teachings of Confucius and his followers as the guiding principles of the Chinese empire. He was also a strict moralist who adhered to the traditional Confucian fear of women and sexuality. One of his subordinates married a beautiful prostitute who was also very intelligent and a talented poet. Outraged, Zhu Xi put her in prison. Under pressure from others, he finally released her. The marriage was declared invalid, however, and she was forced to leave. Like so many others in the moralistic tradition, however, Zhu Xi was himself not without fault: he had one love affair with his own daughter-in-law, and another with a Buddhist nun! My favorite character in the Literature God’s shrine is Kui Xing. You can see a statue of him to the left, and he appears again in the wall painting just beyond the statue. He holds a calligraphy brush in one hand and an ink pot in the other. According to the story, he should have won first prize as the best scholar in the imperial examinations, but the emperor said he was too ugly to be given such an honor. As compensation he was made a Taoist god, the assistant of the Literature God. His job is to choose the winners of the examination competitions by using ink and brush to put his mark on the foreheads of the select few. Adjacent to the Literature God’s shrine you will find a shrine to Guanyin, the “Goddess of Mercy,” who is primarily known as a Buddhist bodhisattva but—as you can see here—is also worshipped by Taoists. (Someone surely has connected Guanyin with the Virgin Mary, right?) In the third shrine, look for a charming sculpture that includes a tortoise (long life), a bat (good fortune), and a deer (career success). The trifecta! And if all this culture has tired you out, walk back to Guan Qian Jie and do some shopping. Take Line 1 on the subway. Ping Jiang Lu is halfway between the Lindun Lu stop and the Xiangmen stop, so take your pick. Walk on the north side of Gan Jiang Lu (east from Lindun Lu, or west from Xiangmen). The south end of Ping Jiang Lu intersects with Gan Jiang Lu directly across the street from the Gloria Plaza Hotel. Take Line 1 to Lindun Lu and walk north on Lindun Lu to enter at the east end. Alternatively, take Line 1 to Le Qiao and walk north on Ren Min Lu to enter at the west end.